Tuina Therapy: Treatment of Adults and Children provides detailed instructions for using the art of Chinese tuina to treat disorders of the locomotor system, gynecological and gastrointestinal diseases, pediatric ailments, and more. While other books may only contain brief sections on tuina treatment and application, this comprehensive guide describes each technique in detail using concise text complemented by step-by-step photographs. The high-quality images clearly demonstrate the practitioner's movements, making them easy to replicate. 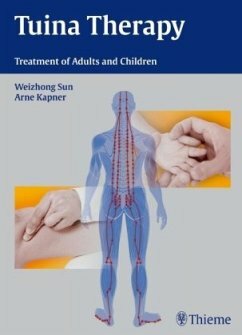 Features: Over 250 photographs guide readers through each step of the various techniques Expert authors thoroughly address the treatment of children -- a topic left out of most other tuina textbooks A full chapter covers adult self-therapy for headaches, back pain, fatigue, and more An extensive appendix contains a list of key pressure points and tuina terminology The official textbook of the German Tuina Academy, Tuina Therapy is an essential resource for acupuncturists, physical therapists, osteopaths, and massage therapists. It is also a must-have for anyone who needs to learn more about this increasingly popular massage technique.